AXO Bullet Kangaroo, leather suit 1pcs. AXO Bullet, leather suit 1pcs. Axo Sport was established in 1978 and immediately became industry leader in footwear, clothing and protective apparel for motorcycle enthusiasts. Initially focused on the off-road, Axo quickly broadened its range of products. Today Axo provides its customers with a full set of gear from head-to-toe for street and motocross riding. 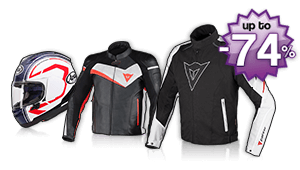 Axo's range of products is constantly evolving; new and innovative items are developed daily, to suit the needs and ever-changing tastes in the motorcycle apparel market. Super-moto and free-styling are now part of Axo's priorities and a mountain-biking collection has recently been added to Axo's catalogue. Not to mention the casual collection, which suits motorcycle lovers when off the bike.